Starting in the 1940s, Sally and William Lippincott, owners of the trading post at Wide Ruins, Arizona worked with the weavers in their area to develop highly detailed banded patterns rendered in vegetal dyes. Most Wide Ruins rugs are characterized by very fine, tightly-spun yarns and a flat, even weave. They feature the full range of new vegetal colors including soft green, mauve, terra cotta, and pale purple, pink and blue as well as the more common yellow, gold, brown, and tan. Black is rare in Wide Ruins weavings. 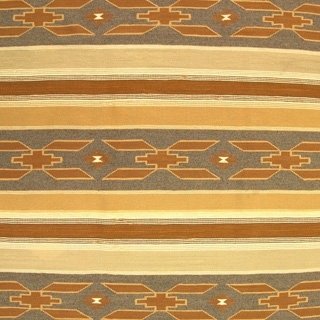 The designs look like finely rendered, small-scale versions of Chinle and Modern Crystal rugs, and often incorporate narrow bands of the wavy line motif. Navajo Wide Ruins Rug by Marie Singer, c. 1970, 28.5" x 19"
Navajo Wide Ruins Rug by Mary Ann Roan, c. 1968, 41" x 26.5"
Navajo Wide Ruins Rug by Nadine L. Toney, c. 1980, 51" x 34.5"
Navajo Wide Ruins Rug c . 1940s, 88" x 57"
Navajo Wide Ruins Rug c. 1930, 69" x 51"
Navajo Wide Ruins Rug c. 1940s, 63" x 45.5"
Navajo Wide Ruins Rug c. 1960-70s, 72.75" x 42"
Navajo Wide Ruins Rug c. 1970-80s, 70" x 47"
Navajo Wide Ruins Rug c. 1970s, 30.5" x 23.25"
Navajo Wide Ruins Rug, c. 1940 , 62" x 37.5"
Navajo Wide Ruins Rug, c. 1950, 74" x 48.5"
Navajo Wide Ruins Rug, c. 1970, 37" x 25"
Navajo Wide Ruins Rug, c. 1970, 48" x 32"
Navajo Wide Ruins Rug, c. 1970, 52" x 28.75"
Navajo Wide Ruins Rug, c. 1970, 60" x 40.5"
Navajo Wide Ruins Rug, c. 1980, 46.5" x 31"
Navajo Wide Ruins Rug, c. 1980, 56.5" x 35"
Navajo Wide Ruins Rug, c. 1980, 66" x 45"
Navajo Wide Ruins Rug, c.1970, 74.25" x 36.5"